Government Job Vacancies Sri lanka Ministry of housing and construction, State Engineering corporation of Sri lanka. Join the leader in construction. 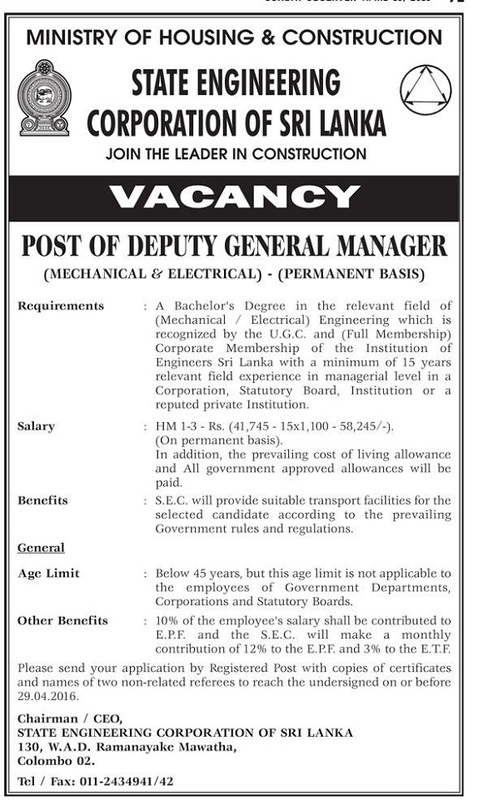 Government Job Vacancies Post of Deputy General Manager (Mechanical and Electrical). Recruitment in permanent basis. Requirement Bachelor of degree in relevant field. Benefits State Engineering corporation will provide suitable transport facilities for the selected candidates according to the prevailing Government rules and regulations. Age limit below 45 years, but this age limit is not applicable to the employees of Government departments, Corporations and statutory boards.